So many people are looking for SKU scanning technology. What does that mean, anyway? SKUs, or stock keeping units, are incredibly intuitive ways for retailers and businesses to keep track of their inventory, and exactly what item is tagged with a particular SKU. SKUs are alphanumeric in nature, usually containing both letters and numbers. One of the advantages of using SKU systems is the ability to make them custom, allowing retailers to personalize their codes and make them readable for their employees. The problem with a system built on SKU is that there’s no easy way to scan these units. Given their alphanumeric basis, they just appear as plain text. When it comes to large inventory management, it can become too hard to keep track of items tagged with SKUs and nothing else. Inventory audits must then be conducted by an individual cross-checking the inventory with a list of SKUs. As the scale of a business increases, the number of SKUs in an inventory system can quickly grow to unmanageable levels. Using CodeREADr for SKU scanning ( a “SKU scanner”) is straightforward and simple. Rather than spend time on lengthy audits and cataloging inventory manually, CodeREADr offers a much easier way of doing things. In both examples, use the Record Scans or Validate Scans instructions for creating and editing your services. Example #1: No barcodes on items. Whether you have a SKU number on the item or not, use these instructions if you have SKUs in your inventory management system assigned to items with corresponding descriptions. Have barcodes printed as labels. The barcode should be the SKU number. Create a Validate Scans service type and upload to codeREADr.com a CSV file of the SKU numbers in column 1 and the the description in column 2. With a Validate Scans service, the app user can use the app’s Lookup button to search by item description and select the correct item from the list. Then have the app user attach the corresponding SKU barcode to the item. If you don’t have SKU numbers yet or you can’t pre-assign SKUs to your items with descriptions, you can create your own SKU numbers and have your app users add a description after a scan. Create a Record Scans service type with app-use prompts to have your app-users enter information about the item. The app user will apply a barcode to an item and then scan it. They will answer the prompts for description (and anything else you need). Export your scan records and build your master database. Important: If your items have no barcodes on them when you’re ready to put into inventory (i.e. upon receipt from your suppliers), you will first need to tag them with barcodes. What generally is best in this situation is to have a portable barcode printer on hand to create the label before putting them into inventory. Example #2.Barcodes already on items. 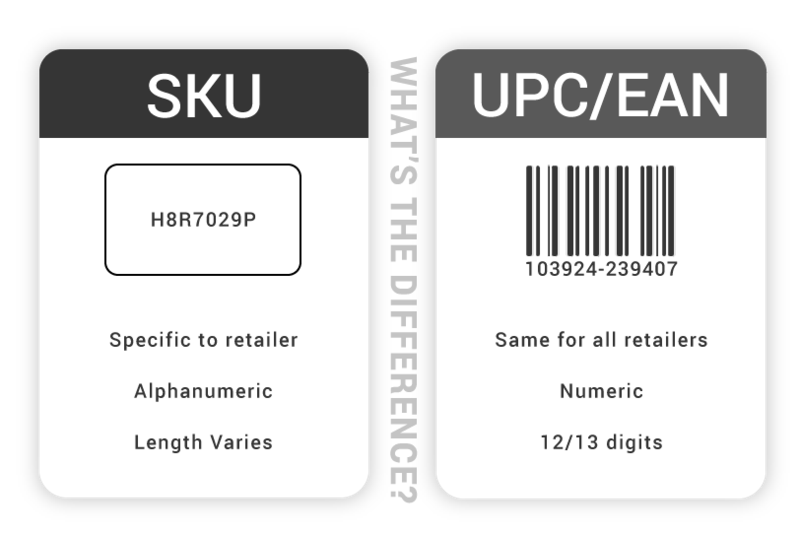 If your items already have UPC/EAN codes (or other barcodes) on them but you’ve not yet associated those UPC/EAN values with your SKUs, you can create that association with CodeREADr. Create a Validate Scans service type with a ‘Short Form / Barcode” Question (an app-user prompt) after submitting a valid scan. Upload a list of your SKUs to a CodeREADr database with the SKU numbers in column 1 and the the descriptions in column 2. Then have the app user submit the search result and then scan the UPC/EAN code. When you export your scan records, the UPC/EAN and SKU numbers are associated with each other. Once a database is built, all scans can use real-time validation to check against it, making inventory audits a breeze!